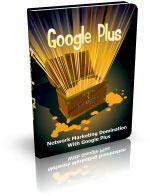 Debuting as a social networking element the Google plus site is something that was launched to rival the Facebook popularity. Launched only recently it is a fairly new introduction to the internet world and should be explored for its potential to providing a good platform for internet marketing. The excitement surrounding this new platform for marketing purposes is definitely creating a "buzz" on the internet marketing arena. Benefiting the small and large business interests, the Google plus tool is expected to help reap in a more significant impactful revenue possibility. But you might be thinking, "I've been trying to use bookmarking and other tools for some time now with little to no success". "The Costs of NOT Understanding This Tool Are Just Too High!" The fact that you don't know how to use bookmarking correctly may not be your fault, but that doesn’t mean that you shouldn’t -- or can’t -- do anything to CHANGE it! I mean, think about all of the money you’re wasting because of how you have been missing out on opportunities that bookmarking tools can give you.